Firefree Class A (“FfA”) can improve fire protection for structures exposed to wildfires and bushfires. FfA has passed the ASTM E84 30 Minute Extented testing, thus meeting the industry standard for non–combustibility. This standard, which is used to rate fire retardant treated lumber, involves measuring a product’s ability to slow down horizontal flame spread and smoke development. The Firefree Exterior Topcoat (“FfE”) is a proprietary coating designed to improve the durability of FfA when used in exterior applications. FfA, when covered by FfE, provides a system designed to provide fire retardant benefits, per ASTM E-84 30 Minute Extended, in exterior applications (walls, sidings, eaves, soffits), thus improving fire protection for structures exposed to wildfires and bushfires. Wildfires predominantly occur in the Wildland Urban Interface (“WUI”) which is a geographic location where structures and flammable vegetation merge in a wildfire-prone environment, resulting in fires devastating to both lives and properties. WUI areas include all structures either built or being built in low to highly forested areas or low to highly vegetated areas including high density housing areas. Firefree Coatings, Inc. is the leading developer of cost efficient fire retardant and fire resistant technologies that help prevent the spread of fire, smoke and toxic gases during a fire, thus giving time to occupants to evacuate and protecting the rest of the property from fire. FfA is tested at third party accredited International Accreditation Service (IAS) fire testing laboratories and is listed by ICC-ES. Firefree Coatings is a member of NPFA, ICC and ASTM E-05 Committee. Firefree Coatings introduced its Ff Exterior Topcoat (“FfE”), a proprietary coating designed to improve the exterior durability of its fire resistant and fire retardant coatings, Firefree 88 (“Ff88”) and Firefree Class A (“Ffa”). FfE on its own does not have fire retardant properties, but its use on surfaces coated with FfA or Ff88 will allow use of such products in exterior applications. FfE is environmentally friendly and has a high quality exterior finish, with excellent moisture and UV resistance, as well as great adhesion and color retention. FfA, when covered by FfE, provides a system designed to provide fire retardant benefits, per ASTM E-84 30 Minute Extended, in exterior applications (walls, sidings, eaves, soffits), thus improving fire retardation for structures exposed to wildfires and bushfires. Ff88, when covered by FfE, can meet the ASTM E 119 standard in certain exterior applications, including walls, sidings, eaves and soffits, involving a property line five (5) feet setback where a one (1) hour rating is required. Such applications can improve fire retardation for structures exposed to wildfires and bushfires. Wildfires predominantly occur in the Wildland Urban Interface (“WUI”) which is a geographic location where structures and flammable vegetation merge in a wildfire-prone environment, resulting in fires devastating to both lives and properties. WUI areas include all structures either built or being built in low to highly forested areas or low to highly vegetated areas including high density housing areas. Firefree Coatings, Inc. is the leading developer of cost efficient fire retardant and fire resistant technologies that help prevent the spread of fire, smoke and toxic gases during a fire, thus giving time to occupants to evacuate and protecting the rest of the property from fire. FfA and Ff88 are tested at third party accredited International Accreditation Service (IAS) fire testing laboratories. Firefree Coatings is a member of NPFA, ICC and ASTM E-05 Committee. FfA is listed by ICC-ES, Ff88 is listed by FM Approvals and ICC-ES. Firefree 88 (FF88) recently received a listing report from ICC Evaluation Service (ICC-ES 4271), confirming that our premier fire resistant coating meets all the requirements prescribed under ICC-ES acceptance criteria AC363. Building/code officials, architects, contractors/designers, engineers and the building industry rely on manufacturers who are committed to the level of quality control found in the International Code Council’s AC363. ICC-ES is the premier product evaluation/listing agency in North America and the most readily accepted in evaluating building products with applicable requirements of the IBC and IRC. ICC-ES is also dedicated to developing model codes and standards (the International Codes) which are used worldwide in the design, build and compliance process to construct safe, sustainable, affordable and resilient structures. ICC-ES is accredited by both the American National Standards Institute and the Standards Council of Canada. Firefree Coatings, Inc. is a leading developer of cost efficient fire retardant and fire resistant technologies that help prevent the spread of fire, smoke and toxic gases during a fire, thus giving time to occupants to evacuate and protecting the rest of the property from fire. Firefree coatings are tested at third party accredited International Accreditation Service (IAS) fire testing laboratories. Firefree Coatings is a member of NPFA, ICC-ES and ASTM E-05 Committee. Firefree Class A (FFA) recently received a listing report ESR-4271 from ICC Evaluation Service (ICC-ES), confirming that our premier fire retardant coating meets all the requirements prescribed under ICC-ES acceptance criteria AC363. Building/code officials, architects, contractors/designers, engineers and the building industry rely on manufacturers who are committed to the level of quality control found in the AC363. Firefree’s solution for cladding fires is based on Firefree 88’s existing testing on multiple substrates (metal, aluminum, polyurethane foam , gypsum, wood…) to a variety of standards including ASTM E 119, FM 4975, BS 476 , AS 1530 and EN 13501 and Room Corner tests (UBC-2, UBC 26-3, NFPA 286). Now Firefree 88 has passed a further set of tests, further validating such a retrofit solution. The tests were conducted to the ASTM 1623 fire test standard, providing a “real world” extreme fire condition to determine the fire resistance of the sample panels in terms of maximum temperature exposure and time as an indication of performance in full scale testing under NFPA 285 the current testing standards currently being used for cladding panels. The cladding panel, which was coated with FF88 per Firefree Coating’s solution (patent application filed), never got close to reaching the backside failure temperature of 121 C (250F) during the 60 minutes of the test. It reached an equilibrium temperature of 100 C (212 F) indicating a similar result would have been reached with the test extended to 120 minutes. By comparison the control cladding panel, which was not coated with FF88, reached the backside failure temperature of 121 C (250 F) in 6 minutes. Firefree 88 can also be used in the manufacturing of new cladding panels resulting in non-combustible cladding with the same insulation quality and cost effective manufacturing. Firefree has developed a retrofit solution (and filed a patent application) for the fire protection of both the interior and exterior of high-rise buildings utilizing combustible cladding. 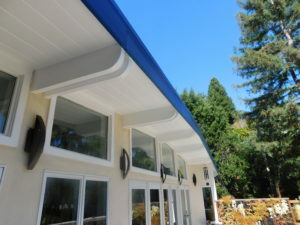 This solution will not require an extensive retrofitting of the entire exterior cladding, in that no removal or replacement of the existing panels is required, effective fire protection is provided to both the inside and exterior, whether or not the building is protected with automatic sprinklers, and the exterior appearance of the building is not altered. This solution can be implemented in a timely, cost efficient manner without major displacement or disruption of the building occupants, or disruption of the building’s daily operations. This approach focuses on the protection, utilizing Firefree 88, an intumescent coating on both the exterior and interior of the building. Applying Firefree 88 on the exterior of the building would protect the existing cladding from ignition from interior and exterior sources and would prevent the fire from spreading to other floors. Applying FF88 on specific walls and ceilings on the interior of the building would prevent interior fires to spread within the building within a floor or between floors, eventually reaching the exterior and the cladding. With the increase in the use of lithium ion batteries and the expanding size of battery packs comes a high level of fire hazards associated with the batteries, both in storage, use and transportation. Firefree coatings have extensive testing on wood, thin gauge metal, carbon fiber and fiberglass composites, all materials used in lithium batteries shipping containers, power storage towers and vehicle battery storage areas. Firefree Coatings has taken another step in passing testing on cardboard shipping containers. On cardboard boxes coated with Firefree 88 and loaded with lithium batteries, the coating was able to contain the battery fire to within the box and not let it expand outward into the additional boxes that made up the total shipping package of multiple sized boxes. Additionally the testing on the boxes coated with Firefree 88 showed that the temperatures within a single box, or within a larger box containing multiple boxes did not exceed 400 degrees C within the batteries storage box space. The temperature on the cardboard boxes reach a maximum of 300 C within the heavily loaded smaller storage box, with additional temperature readings around additional boxes ranging from 30 C to 160 C within the larger cardboard box container in which multiple, smaller boxes were also placed. Firefree 88 qualifies for LEED Version 4 credits. Firefree 88 is under LEED compliant paints and coatings in accordance to CDPH Standard Method v 1.2, 2017 emissions. LEED Version 4 is the latest version of LEED. It went into effect in 2013 and is the only standard recognized for new buildings. Paints earn LEED V4 Low Emitting Materials credits for being emission certified in addition to meeting CARB SCM 2007 VOC limits. Firefree’s LEED compliance builds on Firefree 88’s leading position as an environmentally friendly, green product. Firefree 88 is already eco-friendly as it qualifies as an MPI (Master Painter’s Institute) listed fire retardant paint meeting the stringent requirement for Green Standards Performance GPS-01 and GPS-02. Firefree 88 has also been green categorized under Factory Mutual 4975. This category allows FF88 to be considered sustainable. Building owners who rely on FM Approved Diamond now have FF88 to directly contribute to a building green certification. For further information, please contact us at info@firefree.com, (888-990-3388) (+1 415-459-6488), www.firefree.com.